When a hot flash hits you, it can feel like an unbearable few minutes before it dissipates. And when you're at work or out, it can be even more difficult to function. 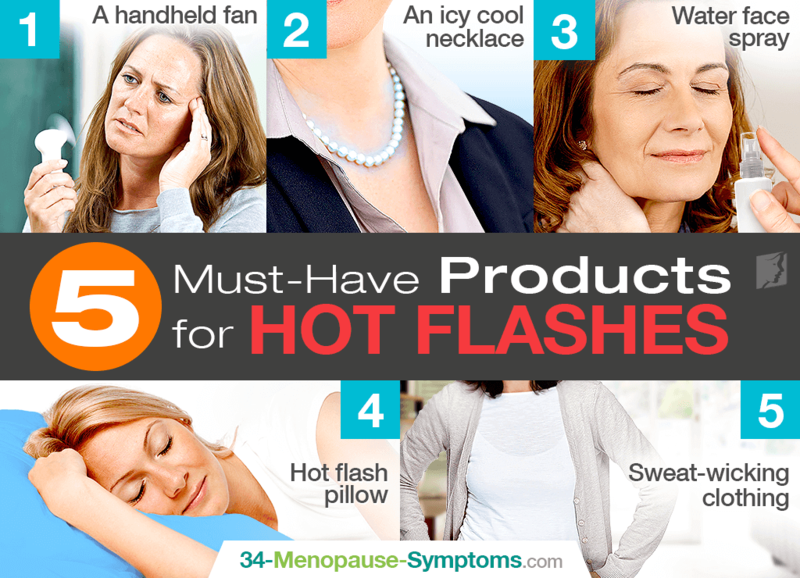 So, to help you out, here are a few of the best hot flash products that you'll need to get you through these tough times. Hot flashes are basically just an increase in heat in your body, so finding ways to cool yourself down are crucial to feeling better during the episode. A handheld fan can be one of the best ways to accomplish this, and it is small enough to fit in a purse or in your desk at work. Battery-operated fans take less work from you, so are more likely to be effective. You'll need a freezer handy for this one, but it can provide a lot of relief. Like those plastic ice cubes that can be reused over and over, there are necklaces that can be placed in the freezer and then worn to cool yourself down. The best part is that once it loses its chill, it can be placed back in the freezer again and used as soon as it freezes back up. If your makeup is appropriately waterproof, a face spritzer might be a good hot flash product for you. This is a small bottle of water that can be used to spray your face - or wherever you want - with a light spray of mist to help you cool down. It works even better if the water has been chilled. You may have heard of lavender pillows that can be heated in the microwave, but did you know many of those pillows can also be frozen? A freezer is necessary for this one as well, but it is worth the effort. A cold pillow wrapped around your neck can help to relieve the worst of the heat symptoms that come with a hot flash. While you may not want to wear sports gear all the time, there are a number of clothing options available that are made from a sweat-wicking formula, but look like normal, everyday outfits. Even wearing a sweat-wicking top under a normal blouse may help mask the evidence of a hot flash. Pajamas are available as well. Although hot flashes can be tough to beat, these products will give you an edge and help you conquer the heat. To learn more about managing hot flashes, read about vitamins to keep hot flashes away.